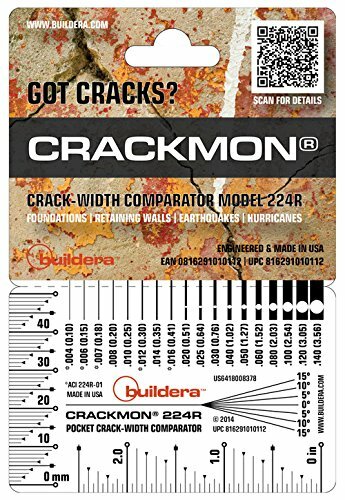 The Buildera CRACKMON® 224R-50 crack-width comparator is a handy, pocket-sized crack measuring gauge for quick assessment of cracks in reinforced concrete, masonry, drywall and other building materials and structures. Use for periodic inspection or in conjunction with long-term monitoring with CRACKMON Structural Crack Monitors. This version comes shrink-wrapped in bulk packs of 50 pieces for resale or high-volume end users. For individually packaged units, see the CRACKMON 224R. Crack Widths (direct measurement): .004 (0.10), .006 (0.15), .007 (0.18), .008 (0.20), .010 (0.25), .012 (0.30), .014 (0.35), .016 (0.41), .020 (0.51), .025 (0.64), .030 (0.76), .040 (1.02), .050 (1.27), .060 (1.52), .080 (2.03), .100 (2.54), .120 (3.05), .140 (3.56).